When Backyard Ocean contacted me about reviewing one of their Float to Fill™ Round Ring Pool Sets, I almost said, “no.” I remembered helping my dad build an old frame pool years ago, and it was time consuming, and frankly I didn’t like the way the finished product looked. 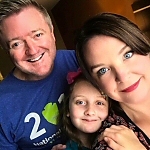 If you’ve been reading my blog for a while, you know it’s mostly focused on parenting related topics from a dad’s perspective, and not so much about giveaways and reviews. I’m quite picky about what I’m willing to review, but in this case I decided it was worth sharing with you. When I visited BackyardOcean.com to take a look at their pools, I was especially intrigued and impressed with their Float to Fill™ pools. There’s literally no frame to construct or liner to mess with. You simply blow up the ring and turn on the hose and it erects itself as it fills! Finally, an above ground swimming pool that’s not only is easy to install, drain, move or store… but one that actually looks great, too. 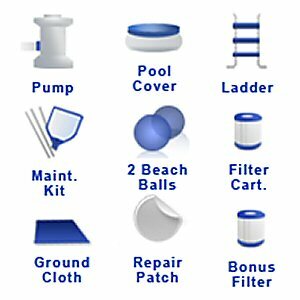 And it comes with all the accessories you need, including a pump, filter, ladder, pool vacuum, skimmer, ground cloth and fitted cover. Oh, and did I mention there’s a giveaway? Backyard Ocean’s sweepstakes are giving away coupons worth $250 for first place, $125 for second place, and $80 for third place. To enter go “like” Backyard Ocean’s Facebook Page, provide your email and name between May 20, 2012 and June 22, 2012. Also, they are having a huge sale right now through next Tuesday, May 29, 2012, so act fast. Their pool sets are a super value at the regular prices, but right now you can get some for up to 40% off. I just checked and their 14′ x 42″ Float to Fill™ Ring Pool Set normally $299.99, is only $179.99! A couple more points: Be sure you have a flat spot to install the pool. As with any pool, it won’t work well on a slope. I liked the entrapment protector on the ladder, to keep someone from getting stuck under it. Deciphering the pump/filter installation instructions was the hardest part of setting this up. Oh, and I recommend you use some sort of air-pump to fill it. The pool’s design with the Float to Fill™ ring is ingenious, but I nearly passed out trying to blow the thing up. They have bigger models, but this one is perfect for our three year old girl. Also, please take a second and read these safety tips. Would you ever get an above the ground pool? Once the pool is set up, ensure high levels of supervision. Teach children to swim, float and other basic life-saving skills; do not consider young children “drown-proof” because they have had swimming lessons. Make sure your neighbors, babysitters and visitors know about the pool’s presence in your yard. Every second counts. If a child is missing, always look in the pool first. Always remember a child drowning is SILENT. No splashing or calling for help. 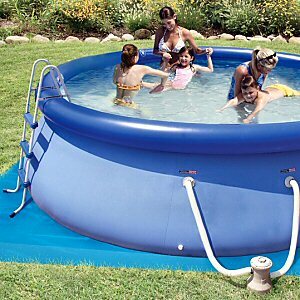 adaddyblog.com was provided a Backyard Ocean 12′ x 36″ Float to Fill™ Round Ring Pool Set (pictured above) for review purposes. 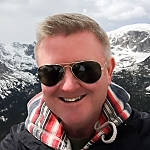 The opinions stated are the views of the author. We do not accept responsibility for loss, damage or injury that occurs from the use of Backyard Ocean products. I love that it doesnt have an ugly frame around it- much sleeker! Yes, the gentle curves and the color are more pleasing than most I’ve seen. And I like that it’s soft to the touch, but still strong (three layers of plastic). It seems to be the perfect pool for our home. I do not like the idea of those unsightly frames that comes with other above the ground pools. Such a great garden pool! My little son would be so glad about it! I wish I could wi this one for his birthday! Do be sure to enter their sweepstakes (via their facebook link above), and you could get your own for next to nothing! Off subject, but I used to love biking next to the Donau (the Danube) when I lived in Vienna (noticed your post about canoeing on it). Looks fun.